Former Secretary of Defense, Leon Panetta, discussed his new book “Worthy Fights: A Memoir of Leadership in War and Peace” as well as both frustrations and concerns with the current state of U.S. governing while speaking with GW students at the Jack Morton Auditorium in the School of Media and Public Affairs on Tuesday afternoon. 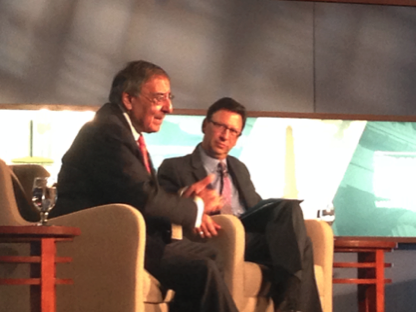 Panetta also provided insight on conflicts abroad and discussed his views on drones. In his discussion of his memoir, Panetta addressed critiques that he was too harsh on President Obama. Despite his respect, Panetta also discussed his concerns over the lack of compromise between the executive and legislative branches of government. Frustrations aimed at Washington proved to be the staple of Panetta’s address. When asked if he had any regrets about drone policy during his tenure as Director of the Central Intelligence Agency, Panetta explained why he did not. As moderator and Director of the School of Media and Public Affairs, Frank Sesno shifted the conversation to Russia, Panetta provided his insights on Vladmir Putin. The event, co-sponsored by the Center for Strategic and International Studies, was the latest installment of the School of Media and Public Affair’s Conversation Series, in which Director Sesno hosts prominent political figures to discuss current events and the media. This entry was posted in Columbian College of Arts and Sciences, Graduate Programs, Local and tagged Frank Sesno, Jack Morton Auditorium, Panetta, Sara Schaeffer, School of Media and Public Affairs, SMPA. Bookmark the permalink.